On Friday the 21st of April I left Brussels airport (Belgium) at about 11.30. I flew to Amsterdam (30 minutes) and from there I flew to Manila. It was a flight from about 13 hours. Flight-conditions were good. When I was at Brussels airport I had asked for an aisle-seat, on the flight to Amsterdam I did get an aisle-seat, however on the flight to Manila I was sitting in the middle of three, this is always hard. However, altogether it was all good. We had a really nice group, we worked well together and we had a lot of fun together. I grew to love them all dearly. We were a very good group together; I will treasure many good and fond memories. The girls in the team, Mallory, Rachel, Rebekah and Jessica all did a wonderful job of teaching the women and the children. I have admired their energy; wherever we went the girls were always busy teaching the women and children. They did a very good work. In all the places where we went, they were always quick to gather the women and children and would teach them. They did a much needed job and it was a joy to see them teaching with so much zeal and love for the children. Bob, Wiley, Josh, Logan and I taught the classes for the adults. They all did wonderful and outstanding jobs. Many good thoughts were shared in the preaching. I arrived at about 9.00 in the morning at the international airport of Manila; I was picked up from the airport by Jerry Toreja and Alex Estoy. They took me to Jerry’s house. Jerry and his family live in a house where also his father- and mother in law live, as well as three of his brothers and sisters in law with their children. This was also the place that the team would use as their home for the time that we were in the Philippines. We slept their most of our nights. When we got to their place we visited for a couple of hours, after that I took a little nap and at about 4 in the afternoon we had a study at the church with the men. I did a study on the 9th chapter of Daniel, showing that the earthly Jerusalem would be destroyed to bring in a better Jerusalem, the Jerusalem from above. After our study we had supper and that night we had more visiting. At about 10.00 Bob and the team arrived from their day of preaching and teaching. It was good to see them and to get acquainted with them. After a good breakfast we had services in Kabitbahayan (Manila), I spoke on “God, our true Shepherd”. That afternoon we left for a three-day trip to the island of Mindoro, we went to the town of Auroro where Eliseo Sikat lives. That is also where the church meets. We arrived there at about 17.00 hours in the afternoon, that same night we started our lectures, I spoke on “three essential things” from the 3th chapter of Philippians. After a good breakfast our teaching started. This day I taught twice, I spoke on the “holiness of God” and at night I spoke on “the 7-fold witness of Christ” from Hebrews 1: 1- 3. After our evening-session we had three souls responding to the gospel-call and they were baptized in a nearby river. While being on the island of Mindoro we enjoyed the wonderful hospitality of the Sikat family. They were very warm, caring and giving. I will remember them very fondly. They were very wonderful Christians, it was a true joy to witness the love they held for all the Christians. After another good breakfast we started the day, on this day we only had a morning-session. I spoke on “the providence of God”. 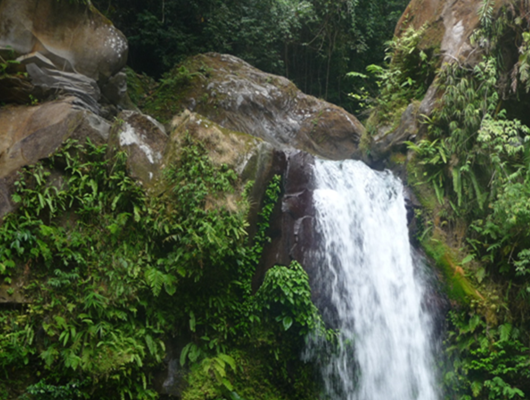 In the afternoon we went out to beautiful waterfalls that were at about a 30-minute drive from the home of Eliseo Sikat and his wife Flor. We enjoyed a good lunch with the whole church enjoying the beautiful waterfalls and we also went swimming. Later that afternoon on our way home we had a wonderful visit with an older preacher. That night we continued our lessons in Aurora, we finished that night with another baptism. We woke up early to take the ferry back to the mainland of Luzon; this is the big island on which Manila is located. We travelled to the town of San Pablo, this is the birth-place of Jerry Toreja and a church meets in this city. I spoke on “God and His ability”. From there we travelled to the town of Laguna, in this town a group of Christians meet and Edwin Depedro works with this group. We left the house early in the morning to travel to Cabanatuan city. We arrived there at about 11 in the morning; we were welcomed by Jhun Bautista who is a preacher. I led a question and answer session that afternoon. That night the team slept in three different places. I, Logan and Jessica stayed with the Veterbo family; they were really good to us. We had a good supper with them and a very wonderful time. Their house was also air-conditioned, that was very pleasant, since it is very warm in the Philippines. The place where they lived was called Canaan. They would tell us that we were going to “the promised land”. We travelled early to the town of Agbannawag. While travelling to this place we had road-construction and we could not travel further by car. So we changed to tri-cycles. That was very nice. Coming in Agbannawag we had our meeting outside at one of the local schools. That afternoon we travelled to San Jose City, another church meets in this city, Aries Bautista worked with this group, a young man (about 18) very dedicated. I spoke on “Unity”. From Agbannawag we travelled to Munoz, we had a short meeting there, one speaker and a question and answer period. The meeting we had here was outside, this group had not been meeting for very long yet. From there we travelled back to the Veterbo residence to eat, rest and sleep. It was an early morning, we woke up at about 6.00, our host Mr. Veterbo, Jessica and I went for a walk to another village, and we took many pictures. It was very pleasant. After our walk we enjoyed a good breakfast. That day we would meet in Canaan, the home-town of the Veterbo’s. We had a very blessed meeting that day. I spoke on “God, our true mother”. After the meeting five souls responded to the gospel call and were baptized. That afternoon we travelled back to Kapitbahayan (Manila). We started the day with another good breakfast, graciously prepared by our host, Jerry and Theresa Toreja. We then walked over to the building and had a good study and worship-service. I spoke on “God’s character, His care”. From there we drove to Sta Mesa, we had a worship-service with them. After our time with them we drove to Marilou Bulacan. There we had another worship-service, I spoke on “God’s character, His love”. Late in the afternoon we drove home and we stopped at Pizza Hut to have a good supper. It was very nice, we had a group of about 30. We thoroughly enjoyed that. Early this morning Wiley and Mallory were starting their travels back to the USA. They had a wedding and needed to leave earlier. Also, this day was planned as a day off for the team. We went to the market and we all bought some hammocks. From there we travelled to the Hard Rock Café to have a wonderful lunch. After our wonderful lunch we visited Luneta park, it was wonderful, we also walked the boulevard, it was a wonderful time, and we had some good ice-cream and a good time of being together. As the Philippinos would say, “bonding time”. Breakfast, and after breakfast we travelled to Pasig, here we had another meeting outside. It was very nice. I was supposed to lead a question and answer period, but my voice was not good and Bob let this time. We also had two responses to the gospel-call. We went to the local swimming-pool and baptized them. After that we went back to Manila. After a good breakfast we travelled to Camarin, a group meets in this town. Jhun Layusa was the preacher for this group. I led a class for teenager’s young men, there were about 5 of them. After that I preached a lesson on “God, our true Shepherd”. From there we travelled to Pinambaran. I spoke on “The sovereignty of God”. We travelled to Quezon Avenue and met with the church for which Jimmy Bobis and Alan Dacoco are working as preachers. We had a very pleasant time with them. I spoke on “The righteousness of God”. After a question and answer period we left to travel to Bayugo. It took us about 2.5 hours to travel. In Bayugo I spoke on “The holiness of God”. That night we also had a get-away time for the team. 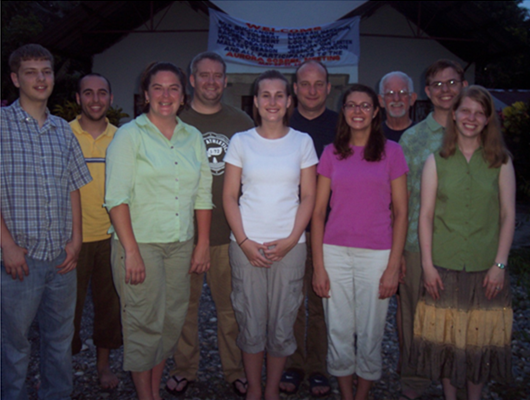 Many of the preachers had gathered at the Toreja residence to say good-bye to the team. We made lasagna for all the ones that had come. Early this morning Bob, Josh and Rachel, Jessica, Logan and Luke left to go home to the USA. I stayed behind, I was to stay for another 5 days. They gave me the day off, I used the day to do some work on the computer, had some good talks with several of the Christians and made it an early night. The next day we were supposed to leave very early. We left early, about 4.00, to travel with all the men of the churches of the Manila area to San Pablo city. We travelled there and were met by Jerry Toreja’s brother. He took us to the Majayjay Falls. We spend the greater part of the day there. We went swimming, had lunch and had a wonderful time of bonding. We had worship at Kapitbahayan. I spoke on “faithfulness towards one another”. After our worship at Kapitbahayan we travelled to Marilou, I spoke on “Onesimus”. We left Manila at about 7.00 to travel to Sapang Palay and met with the church in that place. Vicente Cay works with this group. I spoke on “the power of our words”. We had one baptism at this place. On these two days, Monday and Tuesday, I had the opportunity to travel with about 10 preachers, it was a very beneficial time. We had many good conversations, I was very impressed with their zeal and knowledge. It was very nice to have had this time with them. From there we travelled to Vicas, Larry and Eleazar Ebuenga work with this group. I presented a lesson called “The crossing of the Red Sea”. From there we travelled back to Manilla. That night I was invited by Edwin Depedro to come to his home and have supper with him and his family. We left Manila at about 11.00 to arrive and meet with another group. Jhun Layuso and Redentor were working with this group. This day we had some heavy rain-falls. I spoke on “Lot and his decision to move closer to Sodom and Gomorrah”. We had a question and answer period, at the end Jhun spoke words of exhortation and one soul responded to the gospel-call. She was baptized. That night I made preparation for my travel back to the Netherlands. Time to go home... I was up at about 5.00 to make myself ready. We left the house at about 6.30, the whole Cruz family came to take me to the airport. It was very nice to see their gesture of love. I left Manila at about 10.35, I arrived in Amsterdam at about 19.00 local time. I waited for about 2 hours, took my flight to Brussels, I was picked up by Martijn. He is a good friend of mine, he took me home. I arrived home safe and sound. I look back on a very good trip. It was a joy to be with the Christians in the Philippines. They are very warm, very caring and very hospitable. I was often amazed to see the love, the joy and the commitment of the Christians. I love them and I miss them.